Distribution feeder reconfiguration (DFR) and capacitor allocation are used in distribution systems to reduce power losses improve reliability and keep the voltage within acceptable limits. Distribution feeder reconfiguration is an important issue which can improve the network performance by changing the status of switches to satisfy some objective functions. The performance can be further improved by simultaneous application of capacitors. The DFR problem is intrinsically complex and nonlinear; combination with capacitor allocation the problem becomes more complex than before, hence a precise optimization method is required to solve the problem. 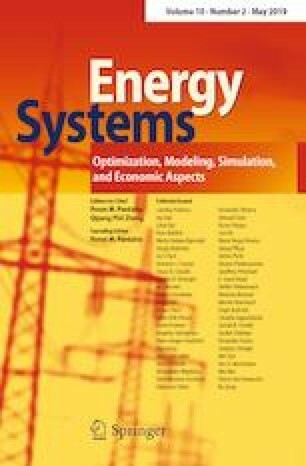 In this paper a multi-objective framework is presented for DFR along with capacitor allocation problem over multiple time intervals as dynamic DFR considering distributed generation, energy storage systems and photovoltaic units. The common objectives of DFR problem in traditional distribution systems are power losses and voltage deviations. Usually less attentions have been paid to reliability and security of distribution network. In the present paper the operation cost, reliability and voltage stability index are considered as objective functions. A novel hybrid optimization method called is proposed to solve the problem. The proposed method is a combination of Improved particle swarm optimization and Modified shuffled leaping algorithms. The obtained results justify its superior performance in solving the proposed complex optimization problem.